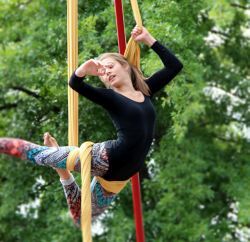 Our students work hard to bring you one-of-a-kind aerial silks performances at local festivals, constantly designing new routines just for our audiences. Click the photo for more images. From parties to ambient performances to bachelorettes, office parties to just about anything you can think of, hire COAA Aerial's troupe AURA and watch us fly or hire Kendall to teach small private parties to give flying a try!